Another dispatch from the post-PC era: Forrester’s latest report on mobile adoption in the enterprise found that 66% of employees now use two or more devices every day, including desktops, laptops, smartphones and tablets. A smaller, but notable 12% percent said they now use tablets at work. That’s still far fewer than the 50% who report only using a desktop, or the 82% who use a desktop alone or alongside other devices. 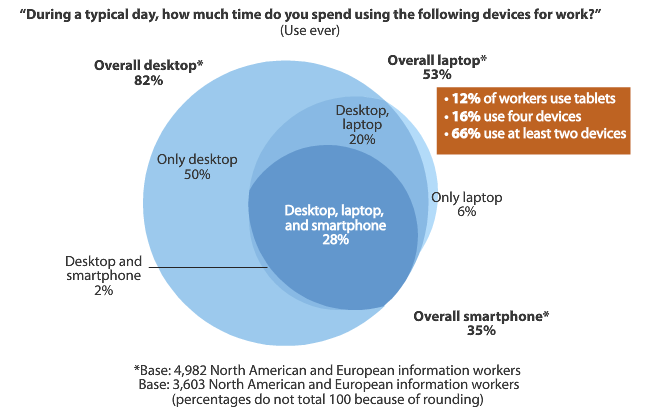 A somewhat remarkable 16% of workers said they use four devices at work, but that number may have slightly shifted from earlier this year, when 20% said they used “four or five” devices. Back then, 22% said they used two devices, 18% said three, 20% four or five, and 14% said six or more. In other words, workers using 2 or more devices was at 74% in February, and has now dropped to 66%. Missing in Forrester’s analysis today was whether or not workers switching from PC alone to tablet alone had any impact here, but it’s worth noting that at the time of the last survey, tablet usage was at 7%, and it’s now 12%. (Forrester’s methodology may also be to blame: see below). Another interesting figure from today’s report: 18% of organizations are implementing corporate application stores. These stores offer employees line-of-business mobile apps that address the needs of the sales force, help desk, supply chain, logistics, and inventory management teams. In other organizations, support for apps found in the consumer-facing mobile app stores from Apple, Google, RIM and Samsung may be supported instead. As with other research produced by the analyst firm, Forrester’s research comes from survey data, which is not as accurate or infallible as usage data. In this case, over 2,300 I.T. mobility decision-makers and nearly 5,000 end user workers in North America and Europe were surveyed.